So we’ve already ticked off one month in 2018 and I’m sure I’m not alone when I say that we’re all pretty much BROKE. After spending all the gift certificates from our titas and titos of Manila, it’s safe to say we’re all on a tight budget. However, don’t let the butterflies in your wallet get in the way of allowing you and your friends to enjoy one another’s company as you dine over delicious dishes! What if I told you that the celebrations don’t have to end? You can still have a good time without the guilt. How? My friends and I discovered a mobile app that allowed us to dine at a restaurant where we enjoyed meals at 50% off. No kidding. I happily discovered Eatigo, a free mobile app where you can get everyday discounts as much as 50% OFF across hundreds of restaurants. I certainly felt like I was missing out on so much before I found this app because there were a lot of restaurants that I’ve been wanting to try but decided to push back because I found them too pricey. If you’re a matipid person like me, Eatigo is your lifesaver. What once seemed expensive is now affordable. Moreover, it is easy to navigate around the app because the interface is user friendly. You don’t even need to print out vouchers (THANK GOD). You can just access it through your phone, choose your restaurant and make a reservation. What’s great about Eatigo is that it also allows you to earn points to exchange as GCs. As I explored the app, I found out that you can also refer a friend and if he/she successfully attends a reservation—both of you get 100 points each. Not bad, right? 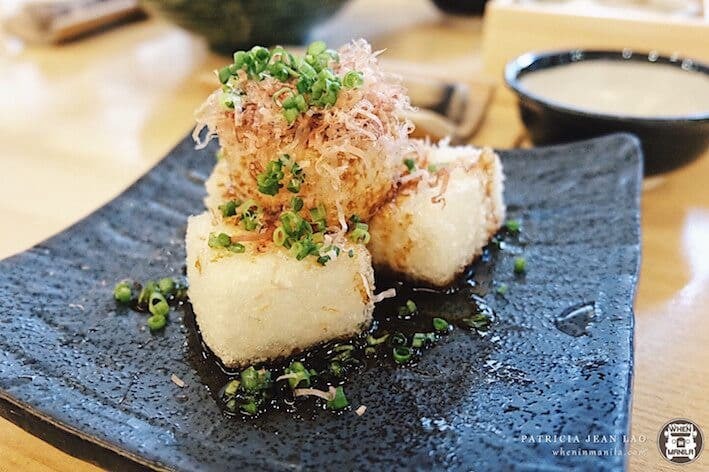 We ordered the Agedashi Tofu as an appetizer and it did not disappoint–crispy on the outside and hot in the middle. With its splendid combination of salt, pepper and garlic flavors, we were already salivating for the next dishes. Along with the tofu steak, we also had some Maguro Tsukudani to start off our meal. Tsukadani is a way of preserving fish through cooking it in a claypot. The Maguro (tuna) was tasty with its sweet-salty sauce. 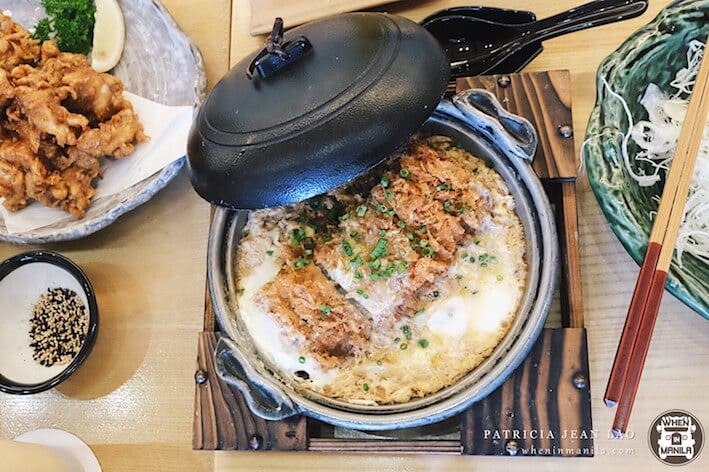 It definitely prepared our palates for the tonkatsu feast ahead. Saboten’s chicken karaage is divine. The meat is cooked just right and the Suntory Kakubin Highball Whisky complemented it quite well as the drink slid down my throat smoothly. I couldn’t believe I was eating high quality Chicken Karaage and Whisky for only Php 225! God bless you, Eatigo! The Claypot Set is my favorite from Saboten. This set also comes with unli cabbage, rice, pickles and miso soup. The deep-fried pork cutlet is delicious in itself, but at the heart of this dish is the impeccable sauce that comes with it. This amazing dish is originally at Php 450 but we got it for only Php 225. Sulit! 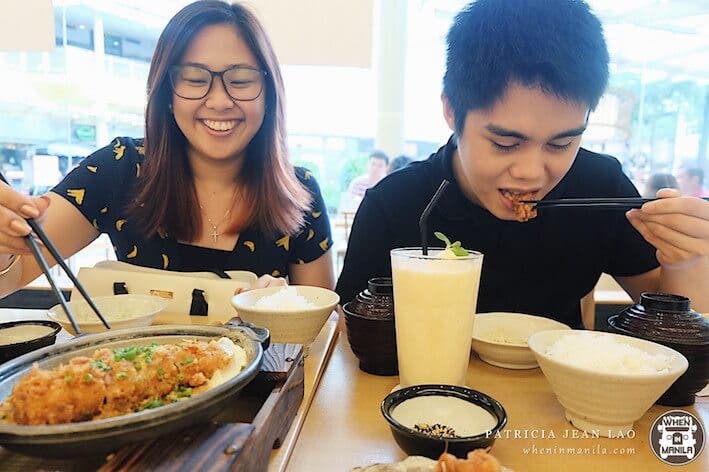 It was a double date for us so we decided to order a lot of dishes for sharing. This is a great decision on our part because we ended up spending way LESS. The Saboten Special Sharing Set was mouthwatering. It comes with two deep-fried shrimp tempura, pork loin cutlets and crab cream croquettes. The tempura was cooked perfectly and I loved that it wasn’t too oily. Although not properly highlighted in the photo above, the serving was HUGE and it definitely gave us the value for money we wanted because we were only paying for half the price. Normally, my friends and I would only order a glass of water to save money. However, thanks to Eatigo’s 50% discount from all the food items at Saboten, we had extra cash to use for beverages! And Saboten’s smoothies are delicious. The yakult-infused drinks, Strawberry Yakult and Melon Yakult smoothies, were a refreshingly unique twist to the normal strawberry/melon shakes. The Ripe Mango & Passion Fruit drink also gave the perfect zesty taste of a fruit shake. I really enjoyed the ice cream of Saboten. They had the creaminess that I always look for in ice cream and they are packed with sweet flavors of green tea and vanilla. We got two whole scoops for only Php 37.50. The Sans Rival cake is HEAVENLY! I loved the buttercream topping they used on this dessert because it definitely tasted high quality. I was so thankful I got to eat it for only Php 105. 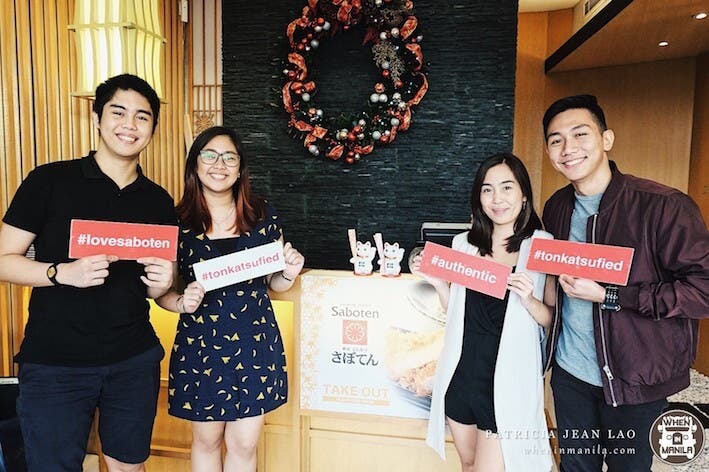 All in all, aside from the fact that we loved everything we got to eat at Saboten, our dining experience was infinitely better because of the money we saved. Imagine, our entire bill was only at Php 1,840, when the original price should have been Php 3,135. We were so full from all the delicious meals but all four of us only spent less than 500 per head. If you want to dine without having to feel the guilt in your pockets, you should download Eatigo because of all the discounts across several restaurants. Plus, it’s a free app so there’s nothing to lose. You can just thank me later. ENJOY!